My name is Julie M. Holloway and I am, Strong, Empowered and Classy. JMH is a multi-passion creative author, graphic and web designer and artist based in the northwest suburbs of Chicago. 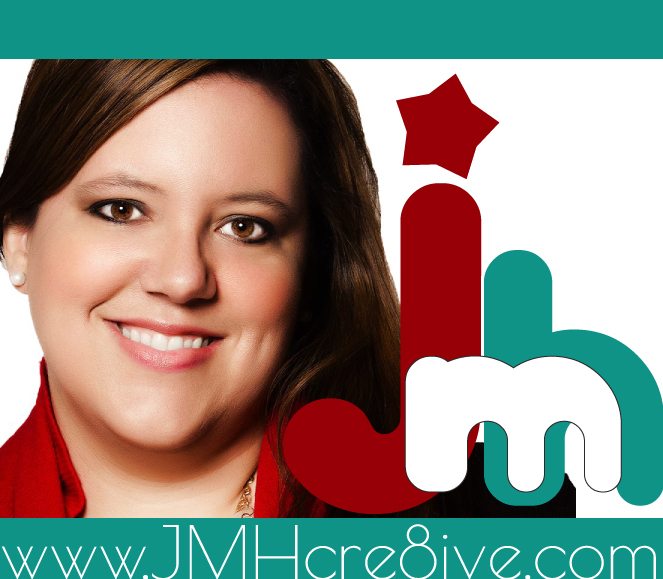 In 2011, she opened JMH Cre8ive Solutions, a full service boutique creative agency. In November, 2011 she published a book titled The Entrepreneur Within You, new inspirational business anthology series featuring stories and experiences told by herself and 18 contributing authors. The second book in the TEW series launched June, 2014. With an enormous heart and hunger for collaborating and assisting entrepreneurs carry through their creative vision, the business continues to flourish. Julie loves spending family time with her husband Darnell and children Jasmine & DJ and also loves to write, paint, travel, spend time outdoors and listen to music! I am a mother, a wife, an owner of a creative graphic arts company as well as a painter and an author. I grew up with the love of painting abstract and colorful works of art. After sixteen years of sitting in cubicles in corporate America, I taught myself graphic design. I have been growing our graphics business steadily for the past six years, now with the help of my husband and a great team. I live for creativity and am so glad that I found a way to make money while doing the things I love most. I am very passionate about pursuing my creative interests. I am also extremely passionate about entrepreneurship, and working with others who are pursuing their passions. About 90 percent of my clientele in the design business are start-up and small businesses just getting their feet wet. It’s the most exciting thing to assist in bringing their visions to life. I am equally passionate about affording my children the opportunities to explore their potential and encouraging them to do the things that they dream about. My daughter since age 9, has written two books and my son is very artistically inclined and also wants to become an author, at the age of 7. I am excited for our creative futures together! Strength refers to the quality or state of being strong; bodily or muscular power; vigor; mental power, force; moral power, firmness, courage; power by reason of influence, authority, resources, numbers, etc. What makes　you strong? Tell us how it strengthens you. The experiences that I have endured in living in the corporate world gave me strengths that I never knew I had. Both personally and professionally, good and bad experiences have built me into the business person that I am today. When I faced quitting my job 2.5 years ago, I had to pull from strength that may not have even existed yet. I was the primary provider for my family as my husband was a stay-at-home dad for ten years. When I faced him and told him I was leaving my career to design a new home-based business, from the ground up, it was very scary. Each day my strength to carry through has grown stronger and stronger, and now, with our marriage and family stronger than ever, we must endure. At my weakest moments, or lowest points in running the business, I have had to look within, and look to Him for guidance. It always carries me through, and I am so grateful. My sense of empowerment comes from so many areas. Being that I am a very visual person, it comes from things that I see every day. From browsing online, to visiting the library, to hanging out at the gym, or at Starbucks, I always have things to take “away” and bring back to my work. I am very empowered by hearing others’ stories of success, trials and tribulations. I enjoy learning from both men and women who have had successful businesses, some, much longer than I have. I truly enjoy engaging online with colleagues, family and friends where we share many commonalities, and diverse experiences. My latest dose of empowerment comes from watching Shark Tank, Super Soul Sunday and some of the other shows on the OWN Network and I am hardly a TV person! I just really enjoy positive energy that I can channel back to my creativity and my own daily goals. Most recently, I have been invited to speak on a few panels with other entrepreneurs and it has been the most rewarding and empowering experiences to date, to be able to also share my story. I have always thought of myself as simple, laid back and one that just goes with the flow. I never really thought of myself as classy and very stylish. However, I have come to a point in the last few years where I have had to further my own “personal brand” as an author, an artist and a business owner. I feel that my style is simply colorful and friendly. I like to think that I run my business in a classy manner; meaning, professional, creative, timely and respectable. I will not tolerate any unclassy clients, and I’ve had my share of bullies and folks that want to feel they hold power over you. I think that our business is very admirable, and we are expanding gracefully with just a few bumps along the way! I am so proud right now. I can’t even tell you how shameful and depressed I was about three years ago. I would sit in my cubicle at work and literally tear up knowing that I was NOT in the right place at that point in my life. The problem was, I knew that I was to be in a much freer and creative space, but I did not know how to get there. I was simply frozen in a state of unhappiness and guilt. I felt that I truly was inhibiting myself and my own personal growth, but I wasn’t sure how to push through that. I was working on my business part-time, in the evenings, and was making about $6-12k per year. The moment I realized that it was my time to go forth with my dreams, was like an awakening. I quit my job, and our family was totally behind me. I had some coaching and many people that supported me. From there, I doubled my salary in year one, and in year two, reached six-figures in net sales. This is our third year, and I am growing, learning, expanding, elevating and hoping that as time passes, I will become an even better CEO! I am content, and very happy with the progress right now, and so grateful for the support I am receiving. I have tried speaking on many occasions, and although it is certainly not my strong suit, the best speaking experiences have been where I was able to share my entrepreneurial journey. I speak honestly, from the heart, and with passion. I am very shy, however, so many times my face will be burning red! If I had the opportunity to speak again soon, I would share some of the lessons I have learned about moving from a solo-preneur, into a small business, with a team. Those have been some of the most remarkable experiences for me, of late.